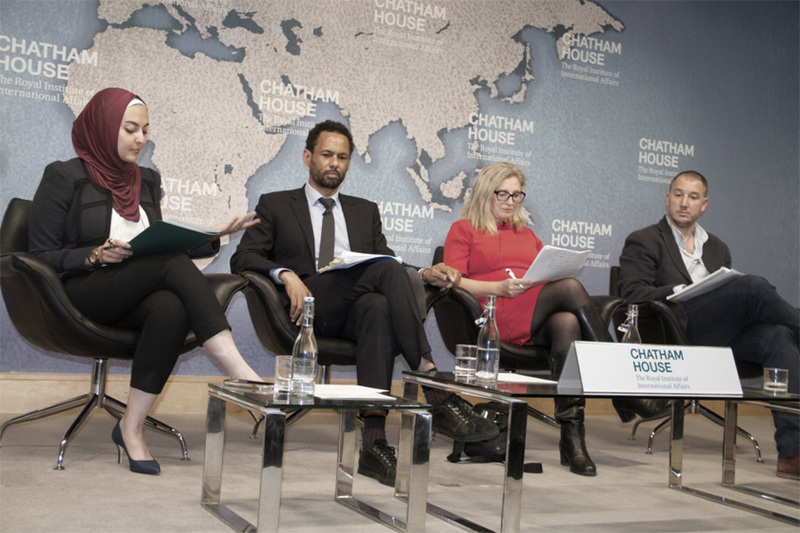 The event notes below are available as a PDF from the Syrian Legal Development Programme and Chatham House, and are included in the Summer 2018 issue of Syria Notes along with other articles on the reconstruction debate. On 25th of May 2018, the Syrian Legal Development Programme held an event to launch their Human Rights and Business Unit, focusing on human rights in the context of reconstruction in Syria. Two panels discussed Reconstruction between political pragmatism and human rights idealism. The first panel was with Maria Alabdeh, Jean-François Hasperue, and Toby Cadman. The second panel had Wayne Jordash, Fionna Smyth, and Joseph Daher. The panels were chaired by Ibrahim Olabi and by Noor Hamadeh, both of the Syrian Legal Development Programme. 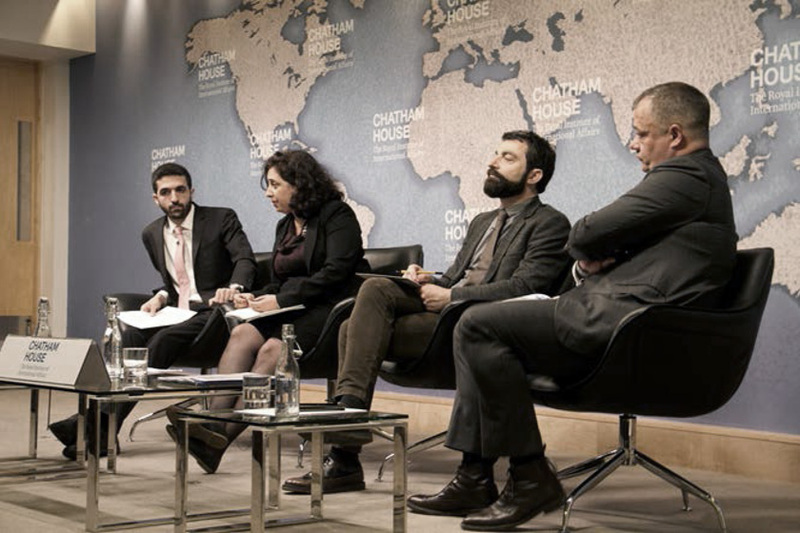 Chatham House hosted the event. On the conditions needed for reconstruction, Maria Alabdeh pointed to the failure to achieve a political transition, with the discussion being shifted from Geneva to Astana and elsewhere, with the result that military people now negotiate the future of Syria. While there is a real need for reconstruction, Maria Alabdeh said the conditions have to be right, and she warned of repeating a Gaza scenario, of paying for reconstruction only for everything to be destroyed again. Turning to the question of ‘where,’ Maria Alabdeh said she felt people were mainly talking about Damascus, Homs, and Aleppo; of reconstructing areas that have been won militarily, completely neglecting a political process. In particular, she pointed to the February 2017 Siege Watch report, No Return to Homs, on how reconstruction already begun in Homs has served to reinforce displacement. The issue of new laws being issued by the Syrian regime to seize property is now receiving increased attention. Maria Alabdeh pointed to how this links to the issue of detainees. ‘As a woman working with women inside Syria, most of them are families of detainees or disappeared, Those women don’t have any right of property. They cannot provide any document because the documents of property are mainly in the names of their husbands or fathers who have been disappeared. So these women are facing double discrimination. ‘When we are talking about the disappeared in Syria, we are talking about hundreds of thousands of people. As a Syrian, I think most of us have grown up with stories from the Hama massacre, about families who were not able to provide any death certificate or anything, and there they have lost property, and they were not able to get even a document for divorce because that person has disappeared. Maria Alabdeh turned to her third question: Who is to do the reconstruction? ‘I have met a lot of decision-makers who were telling me, “we said after Bosnia, never again,” so what about Syria today? When we are talking about protection of women, when we are talking about the commitment of countries to Resolution 1325, on women’s protection, on sexual violence, on women’s participation, where are we about all of this? Are we funding the main perpetrators of human rights abuses and sexual violence? Maria Alabdeh said that while she totally agreed that funds should be protected from going to extremist groups, she would prefer the term human rights violators, so that funds should be denied to all human rights violators. ‘When we have women on the floor, we need to listen to them, it’s not just like, we have women, “tick,” on the peace talks. We actually have to listen to them. ‘The women I work with never forget the disappeared and the detainees, and they will keep looking for them, and they will never give up, but they are using peaceful ways to do this. So when women are saying we cannot have peace without knowing what happened to our beloved ones, we need to hear it very clearly. ‘When women also are saying we cannot have reconstruction without addressing the root causes of the conflict, the economic, social, and political ones, and especially—hearing from women on the ground that I am working with—education. All of us are afraid of ISIS ideology to be spread in the schools of Raqqa; what about the ideology of the Big Brother in Damascus? We need to review this, because we are preparing for the next conflict if we don’t address all of this together. ‘My last, very last point is, how can we discuss peace in Syria if we don’t preserve the public space. I’m a human rights actor. I’m a founder of the Syrian Non-Violence Movement. And today I would be scared to go back to Damascus, even though I have never ever been engaged in any military process, even though I have been set against all use of violence, against all human rights abuses. Responding to a question from the audience on the peace process at Geneva, and on the lack of trust in the various bodies of the UN that are engaging in Syria, Maria Alabdeh answered that she also had lots of criticisms of the UN. ‘The last time I met the Special Envoy, it was last month in Geneva, he was asking us in a public event why Syrian women are not saying “enough, khalas, we need peace,” and I answered we will not say khalas because we are tired of being beaten, and as a woman I refuse to be beaten by the Syrian regime, and to be beaten by the other groups. In response to another question on whether civil society could take on implementing reconstruction, Maria Alabdeh said she didn’t believe that was their role; that civil society should be included and should monitor reconstruction, but should not be responsible for doing reconstruction. Jean-François Hasperue is Political Officer on Syria at the European External Action Service. He began his talk by asking, what should be considered pragmatic today in Syria? He argued that the answer was to pursue a systematic comprehensive lasting peace, rather than following any temptation in the form of quick fixes. Jean-François Hasperue rejected the idea that the current situation is simply that the regime is winning the war, instead asking which war are they winning, and listing all the multitude of conflicts within the larger war. ‘That’s the best illustration of what chaos Syria is right now, the point of divergence of local, national, regional, and global forces, and at the same time this point of convergence of their struggles. The answer, according to Jean-François Hasperue, is that the regime is pursuing reconstruction based on social engineering, aiming to reward their supporters, both inside the regime and amongst its allies. But while many might wish to profit from this, he doubted that many would fund it. Therefore, Jean-François Hasperue said, he believes the European Union has a card to play in being willing to fund reconstruction, but only on the basis of a sustainable peace which is against the current military logic of the regime. For a peace to last, the root causes of the conflict need to be addressed, and this requires a comprehensive peace and a strong political agreement, Jean-François Hasperue said, and he pointed to the UN-led Geneva negotiations as the way to achieve that, as opposed to Russian-led talks in Astana or Sochi. Turning to human rights, Jean-François Hasperue insisted it is not idealism to seek to protect human rights in Syria, and said that while trying to get a political settlement, the European Union should in the meantime continue to work to protect the human rights of Syrians inside the country. Firstly he pointed to the EU’s role in supporting the gathering of documentation of human rights violations, and secondly to EU support for civil society organisations to help Syrians protect their own rights. Responding to a question on whether there was any alternative to the UN in conducting negotiations, Jean-François Hasperue re-stated the EU’s commitment to the Geneva process led by UN Special Envoy Staffan de Mistura, and to the terms of UN Security Council Resolution 2254. On whether the EU can be flexible over reconstruction, he was emphatic. On a question on the institutional corruption in Syria, and the likelihood of corruption prevailing indefinitely even if there was a change in leadership, Jean-François Hasperue agreed that corruption was infecting the system of Syria even before the war, but said this would have to be addressed in a transition to support a way for Syria towards rule of law, while at the same time he believed care should be taken not to replicate mistakes of Iraq, and so the system shouldn’t be just broken as this again would lead to chaos. Toby Cadman is co-founder and head of Guernica 37 International Justice Chambers, based in London with offices in Madrid and Washington DC. Reconstruction, he said, is not just about rebuilding houses, schools, and hospitals, it’s about rebuilding institutions so they are capable of bringing Syria forward, something that is hard to talk about as long as the conflict is still ongoing, with people still being killed and with massive forced displacement. Toby Cadman said that in other cases, in Bosnia and Rwanda, institutional reform was possible because there was some form of political transition, and even if these were not transitions that everyone was happy with, there was at least some degree of influence for the international community in rebuilding institutions over time. Toby Cadman questioned what kinds of people could be involved in rebuilding institutions in Syria, and what kind of vetting would there be of the people in receipt of huge amounts of funds. But given that reconstruction has started in some parts of Syria, and will go forward, Toby Cadman turned to the issue of how to hold those doing the reconstruction accountable—whether individuals or organisations—and how to ensure that what they do is for the right purpose, and that they comply with human rights policy. As an example of the problems of engaging without a political transition, Toby Cadman recalled the UN Oil-for-Food programme in Iraq, an aid effort conducted while Saddam Hussein was in power that developed into a set of corruption scandals. On whether corporate entities can be held accountable, Toby Cadman pointed to the investigation of BNP Paribas over allegations of complicity in the Rwandan genocide. And in Syria, he raised the case of the Lafarge cement plant in northern Syria. Toby Cadman said that for Syrians, the absence of accountability is not a recent phenomenon, as seen most notoriously after the 1982 Hama massacre. On forced displacement, Toby Cadman said that in Bosnia the international efforts to help people return to their former homes had often only led to enabling them to sell their property and move to another area where they felt more protected by their own ethnic group being in government. On the estimated $300 billion cost for rebuilding Syria, Toby Cadman asked where could that money come from when the international community has failed to even find the money needed to properly fund the IIIM, the International, Impartial and Independent Mechanism that was established by the UN General Assembly in 2016 to collect evidence and to prepare files to enable prosecutions for crimes in Syria. To a question on the longstanding an deepening corruption of the governing system in Syria, he agreed that removing Assad and his inner circle would not be enough to change that system. Particularly on the judicial system, he said that one needed to be built, not rebuilt. Toby Cadman argued that despite the level of difficulty and the scale of atrocities, that with small steps now it is possible to prepare for the long term. With no international accountability, no chance of referral to the International Criminal Court due to Russia’s Security Council veto, and no likelihood of an international ad hoc tribunal, the vast majority of cases would fall on future Syrian institutions that would have to spend decades dealing with them. This, he said, would require long term commitment. ‘The situation is so extreme, so many families and individuals have been affected by these things… you can’t just walk away and say it’s too big a problem, it’s too systemic, we can’t deal with it. You have to deal with it step by step. And Syrian legal professionals have to be prepared, trained, and helped by the international community for the next twenty years to be able to deal with this. In getting there, Toby Cadman said the documentation process is important, recognising that we may not get to a court today, but we may do in a few years’ time. That, he argued, could have a knock-on effect for Syrians to then start to have some level of confidence in their own institutions, paving the way for a more stable environment and economy. On the obstacle of being unable to get International Criminal Court referral due to Russia’s veto power, Toby Cadman pointed to a recent initiative for the ICC to use Bangladesh jurisdiction for cases of forced displacement from Myanmar. The ICC has jurisdiction in Bangladesh but not in Myanmar, and this example suggests it might be similarly possible for the ICC to tackle cases of people forcibly displaced from Syria to Jordan, as Jordan, unlike Syria, is a state party to the ICC. On the issue of monitoring where funding ends up, Toby Cadman questioned whether current sanctions are being properly enforced. ‘Don’t forget that there are sanctions against the senior members of the regime, particularly the senior members of military intelligence who are largely responsible for the majority of the crimes that have been committed in Syria. Wayne Jordash is a barrister at Doughty Street Chambers, specialising in international humanitarian law, and business and human rights due diligence. He began by expressing his disagreement with much of what was said by the previous speakers, particularly on the idea that Western states should wait for a political transition via the UN-led Geneva process before engaging in reconstruction. ‘I think the horse has bolted. And the question is not whether there is going to be a new government without Assad, because is that really looking very likely? And it’s not a question of whether we’re going to have accountability via an international mechanism, or very much accountability at the national level. It is not going to happen, not in the short term, or even the mid term, and probably not in the long term either. So the question now is, what happens in relation to reconstruction? Wayne Jordash said that reconstruction work being done in Syria in the name of humanitarian aid was already leading to violations of rights. Wayne Jordash argued that the EU position of no reconstruction before a political transition, of waiting and limiting funding to humanitarian aid, fails to understand that humanitarian assistance overlaps with reconstruction, and fails to understand what a rights based policy should involve. The ‘human rights business’ is not black and white, he said, but involves small incremental interactions at a local level to open up space for better outcomes. Wayne Jordash proposed looking at reconstruction through the lens of business and human rights law, and the framework that this provides. Companies engaging in Syria, or players such as the UN or EU who engage in Syria, are entering an environment where there is a great risk that they will be complicit in violations of international humanitarian law, and so they need to take certain due diligence steps to ensure against that complicity. The greater impact, according to Wayne Jordash, is not going to come from major violations of international humanitarian law, but is going to be the more local damage to communities from a failure to follow a structured approach to protecting and respecting human rights. He maintained that the best way of approaching reconstruction is to use the business and human rights agenda to pressure states and companies to follow this framework. Wayne Jordash said that while these processes weren’t an answer to everything, he believed that they could provide a way for ordinary people in Syria to pressure Western companies and other actors to protect human rights. He was concerned that in making reconstruction contingent on political progress, opportunities for using these processes could be lost. Responding to a question on whether the prospect of prosecutions would deter the more responsible companies from engaging in reconstruction, leaving the field to the less responsible and thus undermine the business and human rights agenda, Wayne Jordash responded that the amount of prosecutions for business-related crimes at the international level seemed low. Toby Cadman asked Wayne Jordash what in that case needs to be done in the international order for there to be a deterrent? Toby Cadman went on to say that he understood the pragmatism of the argument that as reconstruction was going to happen in any case, there was a need to create an environment where it would be done properly, but he asked what possible hope was there that the regime would actually respect some of the principles that were being referred to, seeing as the regime has absolutely no regard for the international treaties and conventions that it’s signed up to? Wayne Jordash responded that what was needed was a mix of approaches, including strengthening legal enforcement and taking people to court when it was possible. ‘But I think that also can be a bit distracting, in the sense that we start to think about it as an issue of enforcement after the damage is done, and I think it’s about being first into difficult environments, with responsible actors demanding big and small things from actors bad and good, and being prepared to set an example, and being prepared to walk away if the result is not sufficiently—if practice isn’t affected. Fionna Smyth is Head of Humanitarian Policy, Advocacy, and Campaigns at Oxfam. Acknowledging that the war was not over, she said there would be a long period where a humanitarian response would be combined with early recovery and development. On the position of donors like the EU not to support reconstruction until the UN-led peace process goes forward, Fionna Smyth said the war economy persists, and asked what happens if there is no satisfactory political solution? Fionna Smyth talked of drawing lessons from past examples of recon­struction. In Afghanistan, Fionna Smyth said, reconstruction was pursued without adequate consideration of political impacts, and of the priorities of rural communities, and the effort was more in state building than in delivering sustainable results for the local population. Fionna Smyth suggested that as part of seeking to help remove obstacles for women’s full participation in Syrian society, NGOs with livelihood support programmes should avoid only supporting occupations that keep women in the private sphere, and should look at local labour markets for other options. Fionna Smyth noted the need to make sure women are at the heart of all peacebuilding processes, and said we need to keep funding civil society in the uncertain period between war and a hoped for peace, saying that’s where the social contract can be built between the citizens and the state to get stability and a safe, secure, and inclusive society. Responding to a question from Ibrahim Olabi on the dilemma for NGOs over whether to work from Damascus, given the reporting on how regime figures have gained access to funds from UN aid operations in Damascus, Fionna Smyth gave an account of Oxfam’s own decision in 2011-2012 to provide water and sanitation aid via regime-held Damascus. She sought to describe Oxfam’s role as a part of a wider humanitarian community response, and said the decision was in part based on Oxfam’s lack of presence in neighbouring states compared to other agencies. Joseph Daher of Lausanne University is the author of Hezbollah: Political Economy of the Party of God, and founder of the blog Syria Freedom Forever. He set out to explain the economic policies of the Assad regime prior to the uprising, and during the uprising. He described how the regime used a process of economic liberalisation through the 1990s, and deepening neoliberal policies in the first decade of Bashar al-Assad’s rule from 2000 on, as a means to privatise the state in the hands of the Assad family and its associates. Joseph Daher uses the term ‘crony capitalist’ for these business figures affiliated to the regime. The result Joseph Daher termed a patrimonial state, where all the centres of power, political, military, and economic, are in the hands of the Assad family. One of the main aims of this process was to attract foreign investment and Syrian funds held outside of the country, Joseph Daher said, and so foreign direct investment climbed from $120 million in 2002 to $3.5 billion in 2010. Even though there was an average of 4.3% growth per year between 2000 and 2010, as much as 60% of the population was living close to the poverty line, with a much higher proportion of poor in rural areas than urban areas. After 2011, even amidst the war’s destruction, the regime continued its process of concentrating Syria’s diminishing wealth. With about 90% of the biggest manufacturers in Syria completely destroyed, the ‘crony capitalist’ close associates of the regime earned high margin procurement contracts, exclusive import deals, and smuggling and other deals associated with the war economy. More independent-minded business personalities left the country. In turn, business associates of the regime gave propaganda support via private media ownership, political support by mobilising their own sectors of society, and military support by funding militias. Turning to how the international community should respond, Joseph Daher said it was necessary to understand that the regime is constituted with corruption at its core, and it cannot function without corruption. The regime’s legislation on reconstruction, such as Decree 66 and Law No. 10, by allowing the seizing of large areas, will be used for dev­elopment projects to benefit regime cronies, and at the same time punish communities known for their opposition to the regime. So the issue of owners and tenants’ rights are central. On international funding, while Western countries and Gulf monarchies are not ready to invest, Joseph Daher doubted that this was a question of human rights, giving as an example that the EU funds reconstruction in the case of Israel and Palestine without having dealt with root causes there. ‘I think we can limit the share where the crony capitalists and the regime can benefit, meaning reconstruction but with conditions: inclusion of the local population in reconstruction plans; property owners and tenants should be provided with new housing, or a true alternative; transparency of budgets; respect of workers’ rights. Even if Syria had a small sector of independent businesses prior to 2011, today they are all gone, Joseph Daher said, and any kind of big business deal needs a regime godfather, and so the issue now for reconstruction is how to find alternatives that serve the needs of the most vulnerable while continuing to pursue justice for human rights violators. While recognising that even conditional reconstruction would enable some regime-linked businessmen to benefit, Joseph Daher said the thing would be to limit this as much as possible, while using the conditions put on reconstruction to empower the local population. In his view, the heart of the matter should be the people on the ground, in particular displaced people. While there has been reporting of some people returning, for every person coming back, three are leaving, he said. With half the population displaced, to say no reconstruction would mean setting those people aside. On the pitfalls that await international NGOs returning to work under regime authority in Damascus, Joseph Daher said that the main Syrian charities there are linked to the regime and have received funds from different international actors, with the most well-known example being the Syrian Trust for Development, chaired by Asma al-Assad. But he also suggested that contradictions in how regime-controlled areas functioned gave potential for conditional reconstruction to use these contradictions to bring about change. Joseph Daher pointed to the regime’s need now to find employment for its base, particularly for the very large number of regime militia men, many of whom now use their positions to profit through extortion, leading to protests against them even from pro-regime populations. ‘There is a big work being done by the regime today, in Aleppo especially, but also in Damascus, to bring back manufacturing industry, because the ones that were not destroyed, they all left the country or they went to Latakia, to Sweida, other areas that did not suffer the same level of destruction. On seeing positive potential, Joseph Daher pointed to achievements in areas outside regime control in the last few years, where the state withdrew and Syrians gained experience in administering their own society, including hospitals, education, and other local services. Joseph Daher also saw potential in further supporting women inside Syria, saying that he thinks the one good aspect of today in Syria is the role women are taking in society, taking a bigger role in the labour market. Joseph Daher saw the Syrian refugee population in Europe as an important potential resource to help a reconstruction in support of local populations. To further explain why he was focusing on empowering populations from below, he returned to the history of Syria before 2011. The 1990s, according to Joseph Daher, saw a process of seeking an opening of economic relations between Syria and the world, and expecting a democratic opening would follow, but while the economic opening happened, the democratic opening was never a key demand. We are now in a similar situation, he said, but with an even harsher regime that has now demonstrated its answer to the challenge of a large movement from below. These event notes are available as a PDF from the Syrian Legal Development Programme and Chatham House, and are included in the Summer 2018 issue of Syria Notes along with other articles on the reconstruction debate.